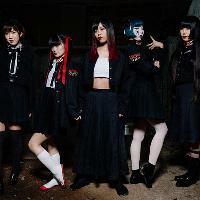 For Birmingham's first Japanese pop idol gig you couldn't pick a better group than horror-themed Necronomidol! Last year we packed Water Rats in London for their stunning UK debut and now, fresh from a US tour and relentless gigging in Japan, they are back and hitting the road with their amazing live performance. Screaming Sixties formed in August 2014 performing both as a band and as a twin vocal unit. Travelling across Japan by car they perform nearly 300 shows a year and exemplify the soul of Japanese live performance. The twin vocal unit makes it’s UK debut on this tour! Although they have over 30 songs in their repertoire, Screaming Sixties adheres to an underground ethos and has yet to release a full album - half of their songs have never been recorded. Their philosophy is that Screaming Sixties can only be experienced live - their passion cannot be contained on a mere CD! Formerly of idol sensation Guso Drop, solo idol Double And can best be expressed by the equation Saki + You = 2&. A self-produced artist, Saki’s wish is to grow into a performer who can be constantly giving back to her fans.